We are military spouses. We are wives who sleep with the phone by our side in case our husbands get a few minutes to call from the front lines. We are trying to balance family, career and fill in for a spouse who can never be home as much as they wish they could be. No matter how much we love a job, or a community, we know we will have to move to the next duty station. We not only understand, we’re also here to cheer you on. Interested in becoming a contributor? Email: info@salutetospouses.com. As a contributor here at Salute to Spouses, Morgan adds a more educational angle to our editorial mix. With a background working in admissions departments for educational institutions, she is very knowledgeable about educational topics for working women. As a former admissions representative at Bryant & Stratton College, Morgan brings good experience to her writing. Jan Wesner Childs is a professional journalist, writer and blogger whose work has been published around the world. Jan’s written about local government, Kosovo refugees fleeing their homeland, war in East Timor and everything in between. She’s also been married to the military for 20 years, which brings its own unique set of professional challenges. Jan’s pretty sure she holds the record for most job interviews, and can’t remember any more all the different places she’s worked. In between paid jobs, she’s held several volunteer positions in organizations that support Army families. Jan grew up on the beach in Florida and since then has lived in Hawaii, Okinawa, Korea, Germany and Kansas – just to name a few. She spends most of her time writing that elusive novel and chasing around her two kids, ages 7 and 10. Rebecca Yarros is a former military brat to dual military parents. The family moved seven times in 12 years before finally settling in Colorado. She has been married to her soldier husband Jason for almost 11 years and the couple has four young boys. You can read about Rebecca’s adventures as a military wife on her blog, The Only Girl Among Boys, voted the most popular blog in Circle of Mom’s Top 25 Military Moms. During her husband’s last deployment, Rebecca penned her first novel and is in the process of having it published. Interests: In her spare time, she enjoys crafts, reading and grudgingly, running. Sarah B.Young has been an Army spouse for ten years. In those ten years she and her husband Bill have been separated by deployment for three and a half years. Currently, the family is working through their fifth deployment. The mom of three is a regular volunteer with the FRG, her local spouse club and Cub Scouts. Jessica Howington is a prior stay at home mom with a background in education and healthcare. As a researcher and Team Lead for the writing team for the award-winning site FlexJobs , she strives to support those in search of flexible employment opportunities through finding and verifying legitimate flexible positions. She provides job search information, tips, and insight into the employment world related all job seekers through theFlexJobs Blog. Michelle Sherman, Ph.D. has committed her career to supporting families/youth affected by mental illness and trauma/PTSD. She directs the Family Mental Health Program at the Oklahoma City VA hospital, and is a clinical professor at the University of Oklahoma Health Sciences Center. She co-chaired the first American Psychological Association Presidential Task Force on Supporting our Military Families, and serves on the Scientific Advisory Board of the Military Child Education Coalition (MCEC). She is also the author of My Story: Blogs by Four Military Teens and Finding My Way: A Teen’s Guide to Living with a Parent Who Has Experienced Trauma. MAJ (Ret) Ed Dennis joined Bryant & Stratton College Online as the Military Relations Manager in June 2010. Prior to joining Bryant & Stratton College, Mr. Dennis served for 21 years in the United States Army starting as a Private and retiring with the rank of Major. Throughout his career he used the Army Continuing Education System to develop himself personally and professionally. His extensive knowledge and first-hand experience with the armed forces brings invaluable expertise to Bryant & Stratton College about what active-duty and veteran military students need. While in the Army, Mr. Dennis held numerous leadership positions including three separate Commands, Executive Officer, and Instructor/TAC for the Ordnance Officer Basic Course and Officer Advance Course. Mr. Dennis holds a Master’s degree in Business Administration from University of the Incarnate Word in San Antonio and a Bachelor of Arts in Employment Relations from State University of New York at Potsdam. Interests: When she is not studying, Jennifer enjoys scrapbooking, playing on the computer, cross-stitch and spending time with her family and friends. Jennifer Spare has been an Army wife and stay-at-home mom for 14 years. Now, as her two children grow, Jennifer is focusing her efforts on earning a Bachelor’s degree in criminal justice. In 2012, she celebrated earning her Associate’s degree; a long fought battle as she changed schools and had to satisfy new requirements over the course of three PCS moves during her studies. Since 1998, Jennifer and her husband have lived at Camp Pendleton, Fort Lewis, Fort Carson, Fort Bragg and Fort Leonardwood. 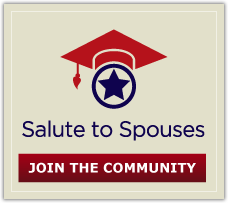 Bryant & Stratton College Online created the Salute to Spouses scholarship after the U.S. government temporarily suspended and later reinstated a restructured MyCAA. Spouses of active duty U.S military personnel are eligible to receive $6,000 towards a Bryant & Stratton College Online degree with the Salute to Spouses scholarship.The Salute to Spouses scholarship program is an opportunity for military spouses to advance their education and become more competitive in the modern job market.